The posts for this investigation are 4 audio recordings of the portal. They were recorded in the Old Town Center in the old Gypsy Trunk shop, the Baker house, Grumps and The Old Texas Brewing Company. The recordings are in this order. I used a different method to make the recordings. I used to just put my recorder in front of the device and record what was coming from the device. That method also picks up the conversations of the people around the portal. My Olympus recorder is capable of pass-through recording. I connected the recorder between the output of the attenuator and the input of the amplifier. This way I captured only the output of the device and not the voices of those of us listening to the output. The recordings will sound like gibberish when you first start listening to them. The application I used (Portal) has voice samples in reverse English. As time passes and the spirits learn to use the app, the speech of the spirits will be understandable in English. Once you start being able to understand words in the conversations, you will know that the spirits are figuring out how to use the app. I did not capture much during the June 8, 2018 investigation. I did not get anything on the Microsoft Kinect. I have two portal sessions that I recorded on audio. There is nothing to see on video because the app I use does not provide any kind of video. The first recording is in the old Gypsy Trunk location in the Old Town Center. The second recording is at another location during the investigation. This investigation involved the two interurban cars, the Old Town Center, The Baker houses, Grumps and The Old Texas Brewing Company (OTBC). While the attendees who had never been in the interurban cars toured them, the rest of us when to the Gypsy Trunk store space in the Old Town Center. There was quite a bit of activity in the Gypsy Trunk and the other stores in the old shopping center. I used the Huff Portal in the Gypsy Trunk and made an audio recording of it. I used a new app for this portal session, an Android app that uses human speech samples as other portal apps do, but the samples are recorded in reverse English. This has an effect that helps identify when a spirit is using the portal. If the speech heard in understandable English, a spirit or spirits is/are using the device. Listen to this audio and judge for yourself. After we explored the Old Town Center, we moved to the Baker houses. The is an old house and a newer house on the lot. Walton Baker built a new house that wrapped around two sides of the old house. I only have media from the old house. I used the Kinect to see if I could detect spirits this time. At least one spirit did appear on the Kinect. The video shows possibly two spirits, identified by a stick figure not shown inside of a body. As you watch the video, notice the way the stick figure is applied to the humans you can see in the room and the stick figures that are not attached to a body. The unattached stick figures are the spirits. Angelyn comes over and checks out the figure that is laying on a table, seeming to dance. She gives an explanation of this behavior. After exploring the Baker houses we went to Grumps. When we are at Grumps, we always do our investigation upstairs in the party room. I made a video there and you can watch it below. The last place we went was the Old Texas Brewing Company. We always go to the party room in the back to make contact with our spirit friends. See the video below for our adventure there. A new post has been added to the Burleson page. The Wood Shopping Center investigation. The Burleson page has been updated with audio and video from the October 24, 2015 investigation. This investigation features the use of a Portal device that allowed us to speak with the ghosts on the second floor of Babes, and we were able to hear them reply and even talk to themselves. The Portal was so interesting that it was the only thing we did at Babes. Here is the link to the page. NOTICE: The ghosts use some bad language during the session. I am letting you know so that you will not let children listen to that session. On Friday August 28, 2015, I tested a modified Huff Portal at the Burleson Visitor Center. Pat and Vivian were there waiting to see if anyone would drop by for the Historical Ghost Tour. I told them that I wanted to test the device since there were plenty of ghosts there to test it. I put it together…it consists of a guitar amplifier with reverb capabilities, a noise reduction guitar pedal and the signal source. I was using an HP Stream 8 tablet with several Ghost Hunter Apps Windows ghost box applications. I have 3 of the apps installed: SCD-1, Vocibus and Ghost Box Rift. I connected the tablet to the noise reduction pedal. 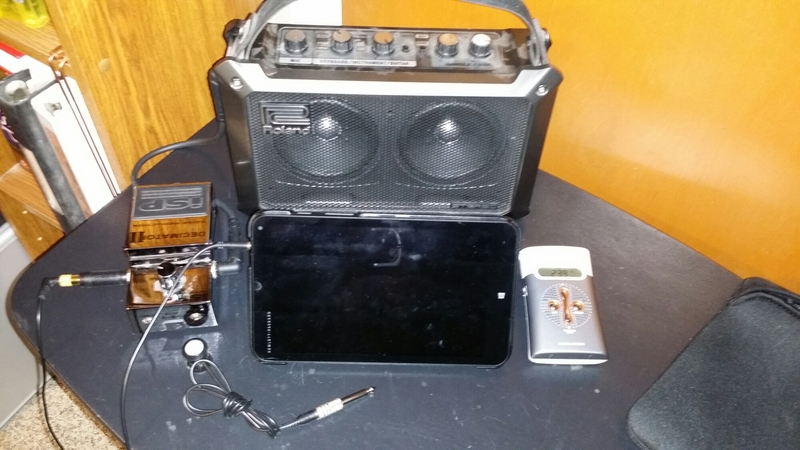 I tested all three apps and a ghost box made from a modified Radio Shack radio. You will hear me use all 4 sources in the audio. The most effective is the Ghost Box Rift application. The portal sounds like being in a crowded restaurant, but if you listen closely, you will be able to make out words and responses to our questions, especially on the Ghost Box Rift. I also have a picture of my portal below. WARNING: There is some bad language used by some of the ghosts. If you cannot stand to hear the “F” word, you do not want to listen to the audio. I was not aware that we have potty mouthed ghosts in Burleson.